If you are a regular exerciser who has forced yourself to take part in a wide range of sometimes boring and unrewarding cardio and abdominal workouts just to get a six pack (which you haven’t really got yet anyway), then it is probably time to change things up. The first time I saw someone working out with a kettlebell I was a little skeptical, and I wasn’t really sure of the wisdom of it. After all, it seemed like he was about to break something the way he was throwing the kettlebell around. But, he had a great six pack and well defined muscles, so who was I to judge. What are the kettlebell workouts for lower abs? Looking back now, I realize how stupid I was. My experience since then tells me that kettlebell workouts are actually amongst the best exercises for midsection strengthening out there. They are challenging, safe, and provide a much more efficient way of strengthening your muscles. Kettlebells are a form of free weights – weights which are not connected to any bar or machine, and which can be manipulated at will to provide resistance to a wide range of muscle groups. If you have always wanted great abs, but have never seemed to be able to get them, then keep reading to discover how kettlebells can help you! Doing an abs workout with kettlebell moves can seem daunting sometimes, but it really isn’t that hard. There are a wide range of exercises and movements that you can do, and you will definitely be able to find something which is suited to your experience level and fitness. The first thing to do if you want to tone your abs with a kettlebell is to get hold of a kettlebell (or join a gym, but I don’t recommend that). Don’t fall into the trap of choosing one which is too heavy, as this will just lead to injuries and other problems, not well toned abs. You then need to learn how to do simple kettlebell exercises. YouTube is a great resource for this, as there are literally thousands of highly educational and interesting videos out there which are great when it comes to learning new exercises. One of my favorite kettlebell exercises is the kettlebell twist – also known as the Russian twist. Performing a Russian twist with kettlebell actually isn’t as hard as it looks. With a little bit of practice and training you will be able to master it, taking a huge step on the path to a perfect midsection. Begin by sitting on the floor with your knees slightly bent. You can use a yoga mat for more comfort if you want. Take the kettlebell and grip it tightly in both hands with one hand on each side of the handle. Twist your body as far as possible each way, your arms holding the kettlebell until they are as far from your body as you can get them. Bring your arms back in, twist the other way, and extend again. Repeat these movements 10-20 times. It is important that you use a kettlebell which I light enough to allow you to perform this movement efficiently and without hurting yourself. 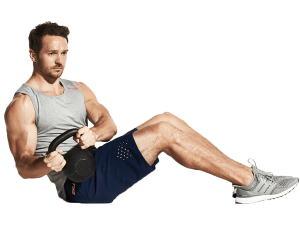 One of the best killer ab workouts for men to do at home involves a few simple kettlebell movements. See my list of the best seven ab exercises below to get an idea about what you should include in your workout. Note that you need to give your muscles time to recover between workouts, especially if you don’t have a great level of fitness when you begin. Again, a kettlebell core workout can be completed by performing a few simple exercises, each of which involves using the kettlebell to provide resistance to your muscles. I can’t stress enough how important it is to make sure that you don’t use a kettlebell which is too heavy. Doing so can only turn out badly! The weight is meant to be enough to provide resistance to your muscles, not to make you strain as you try and lift it! There are some specific kettlebell core exercises which target only the lower abs. While these are beneficial, it is important that you don’t fall into the trap of neglecting muscle groups or only exercising certain parts of your core. The kettlebell twist is undoubtedly one of the best kettlebell exercises to strengthen your lower abs, and it also works the rest of your core muscles. The best kettlebell ab exercises for men are those which both challenge and work the person doing them. It is important to realize that there is no ‘best exercise’ – only good ones. Two of the best are kettlebell swings and the Russian twist. If you don’t really know what any of those exercises actually are, then a quick Google search will help you familiarize yourself with them. Use the right weight kettlebell! If you aren’t sure how to do something, then ask. People are always willing to give advice and to help you improve your technique. Persist, even if you don’t see results to begin with. Try and maintain a good diet to make sure that you don’t have fat covering your abs. Good luck and happy kettlebelling!